We kindly welcome you in our farmhouse in Berlaar, nearby a picturesque little village called Gestel. In the surrounding villages and cities as Lier, Heist Op Den Berg, Mechelen, Antwerp and Brussels you can enjoy plenty of sightseeing and discover lots of tracks for walking or biking. We can provide you with all necessary information about them. Our bed & breakfast, Fortuna Lenta, has a separate entry and can offer room for 6 persons. 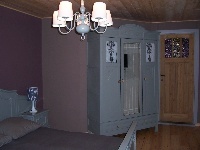 We dispose of 3 double rooms, all with a cosy corner with television, a separate bathroom with toilet, washstand, shower or bath. Breakfast is served in the cosy hall..